Calling all ocean enthusiasts, surfers and boaters, Mariner Way is a great North Myrtle Beach resort for your next beach vacation. This charming North Myrtle Beach resort is mid-size and its quaint ambiance is excellence when you seek a relaxing North Myrtle Beach vacation near the Atlantic Ocean. Mariner Way is a North Myrtle Beach resort that only has three levels of North Myrtle Beach condominiums. The entire North Myrtle Beach resort is built on stilts which means there is covered parking on the ground level at Mariner Way. And each of the North Myrtle Beach rentals at Mariner Way has a private balcony with ocean views. This North Myrtle Beach resort is located right across North Ocean Boulevard from the Atlantic Ocean and the inviting sandy beaches. The elevator and stairways are found right in the middle of the hallway on each floor of this North Myrtle Beach resort so getting from your North Myrtle Beach condo to the swimming pool or the ocean or your car is a breeze. There are only five North Myrtle Beach condominiums on each floor of this North Myrtle Beach resort. So imagine the peace and quiet you will enjoy during your North Myrtle Beach vacation at Mariner Way in North Myrtle Beach, South Carolina. This North Myrtle Beach resort has a sparkling blue swimming that is surrounded by a rather spacious sun deck. Pick a chaise lounge chair and get a suntan while listening to the kids play in the pool. Nearby palm trees sway in the gentle breezes and if you are really quiet you might be able to hear the waves crashing ashore across the street. Near the swimming pool at Mariner Way is a grill and an area for your family to have a North Myrtle Beach cookout during your beach vacation. Whether you opt for the long-time favorites of hamburgers and hot dogs or if you live more adventurously and grill up fresh shrimp and flounder having the option to barbecue during your North Myrtle Beach vacation is a nice amenity to have on hand. This second-row North Myrtle Beach features two-bedroom North Myrtle Beach vacation rentals. 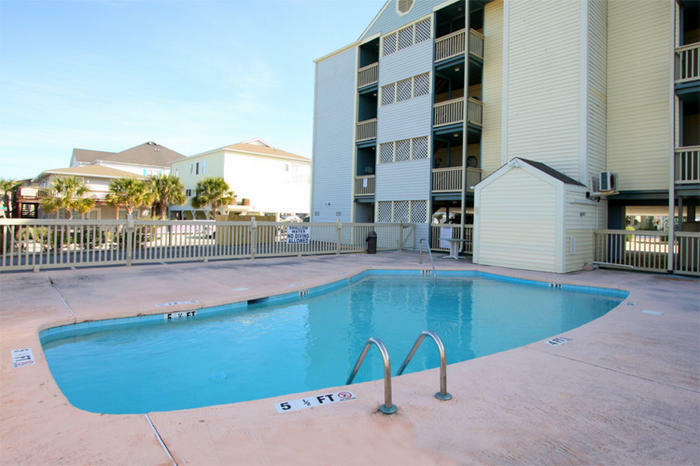 Each of these condos in North Myrtle Beach, South Carolina has two baths. Some of these two-bedroom North Myrtle Beach condo rentals can accommodate up to six people quite comfortably. These North Myrtle Beach rentals are nicely decorated and feature a well equipped kitchen, living room that opens to the private balcony and a washer/dryer unit. It is easy for your family to make themselves at home in the comfort of these North Myrtle Beach condominiums. Elliott Beach Rentals is not affiliated with onsite management or the HOA of Mariner Way.